Jan. 5, 2018 - Terrace House, the highly anticipated development by Pritzker Prize-winning architect Shigeru Ban, with its highest point sitting at 232 feet above ground level, has received official approval to use exposed mass timber in the top seven storeys of this 19-storey building. 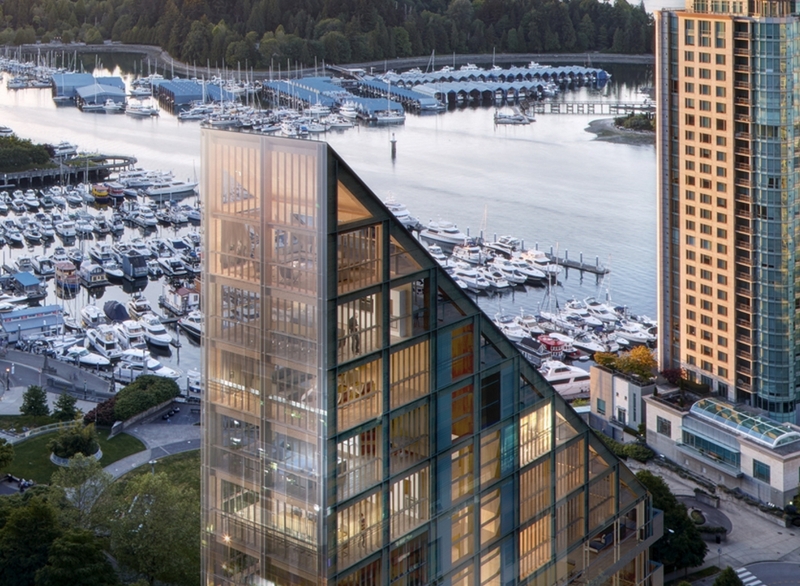 The issuance of the Building Permit required approval of an “Alternative Solution” to demonstrate compliance with Vancouver’s Building Code, thereby allowing the use of mass timber in the construction of a high-rise building. This approval from the Chief Building Official’s Office is significant as Terrace House is the tallest hybrid wood structure approved for construction in North America. Prior to the official approval of Terrace House, the use of exposed mass timber in a hybrid wood structure of this height had never been permitted in either Canada or the United States. While there has been much discussion of the environmental benefits of tall mass timber buildings, few exceeding 6-storeys have been permitted or constructed. The recently completed Brock Commons, an 18-storey student residence at the University of British Columbia, was permitted only as an exception to the B.C. Building Code and the acceptance was based in part on covering all the timber with fire-rated gypsum wallboard. The approval is a milestone for Terrace House and the City of Vancouver. It was achieved through a process of performance-based fire and structural engineering tests supported by analysis of fire risks including risk of fire after earthquake. Tests demonstrated to the City and the expert peer reviewers that this hybrid mass timber building is as safe, if not safer, than a conventional concrete or steel high-rise. The approval is a major step forward in Vancouver's goal of being the Greenest City in Canada. Wood is a sustainable and versatile building material that stores, rather than emits, carbon dioxide for the life of the structure and beyond. The environmental and performance benefits of wood construction include reduced greenhouse gas emissions, reduced embodied energy, renewable benefits, and direct occupant and builder health benefits. For Shigeru Ban Architects, wood is valued for many of these reasons, and particularly for its economy, tactile qualities and performance attributes. Terrace House has advanced tall wood construction in Canada through its use of exposed mass timber not only as a structural, environmentally sustainable element, but also as an integral interior finish within a residential market high-rise.